If you are looking to satisfy your guests with delicious dishes with full flavor be sure to stock up on the best specialty Mexican foods. With a few staples in your fridge you can make a wide variety of Mexican favorites. With just a few ingredients you make a variety of excellent dishes. Take a look at this list. Write down this list and bring it on over to our market at Productos Real! Some people think that chorizo is just for eggs. This could not be further from the truth. Mix it into your burger patties or cook it and pile it right on top of the burger. It also makes for a great appetizer of queso fundido. This is a great specialty Mexican food that is served before meals. 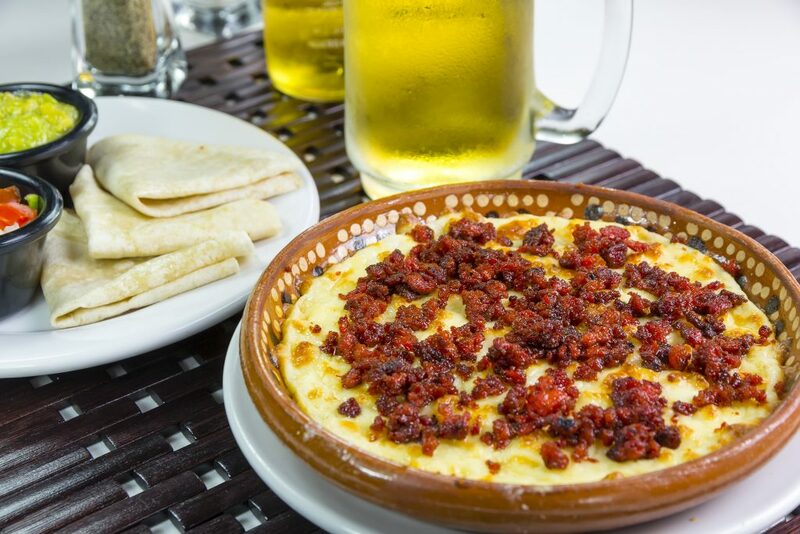 It consists of melted cheese and cooked chorizo for a delightful pre-meal treat. If you are looking for more creative ways to use chorizo, you can add it to your favorite chili bowl recipe or to your beans with a layer of cheese on top. Chile colorado sauce is a must have in the fridge. Some like to buy plenty of bags and then keep it in the freezer to always be ready to create a specialty Mexican food dish on the fly. Of course, enchiladas is the most common meal created with chile colorado. But there are plenty of delicious recipes that call for it. Chile colorado is actually the name of a dish as well. This is shredded beef topped with the red sauce and eaten in flour tortillas like a burrito or in a bowl with a hefty side of corn tortillas. At Productos Real we offer a wide variety of delicious meats. Colitas de pavo make great tortas. If you are in the mood for tacos be sure to pick up some buche, barbacoa or tripitas. Tripe is another excellent choice to woo your guests. There’s nothing better than a huge pot of menudo simmering for several hours on the stove. You’d be surprised how fast this dish goes. Don’t count of too many leftovers with this delicious meal! When you are looking for the best ingredients to create delicious meals for your friends and family, be sure to visit Productos Real in El Paso. We offer a wide variety of products to help you stock up and cook for your guests. Contact us today for more info.